The home-improvement specialist counts on a broad range of customers to drive its consistent growth. 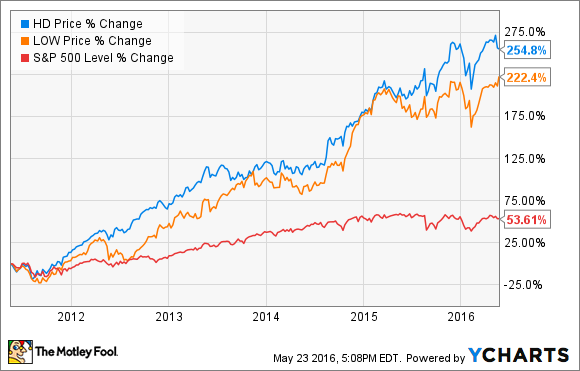 Home Depot (NYSE:HD) has dominated retail like almost no other company in recent years. The home-improvement leader continues to put up strong comparable sales and profit numbers while its brick-and-mortar cousins in department stores, electronics, and apparel struggle. Through a combination of smart management and a booming housing industry, shares have soared over the last five years. Who's been driving Home Depot's strong growth? Let's take a look at some of its key customer groups. Home Depot's customer base can be broken down into roughly three categories. Generationally, baby boomers are Home Depot's most important customers. The generation born after World War II accounts for about half of Home Depot's revenue, which is unsurprising considering about 40% of the nation's homeowners are boomers, and they own about half of the total home value in the country. Still, like other retailers, Home Depot's realizes the fastest-growing segment in home ownership is younger people, namely millennials. Home Depot sees the younger generation as more interested in do-it-for-me services and as particularly value-conscious. Home Depot and Lowe's (NYSE:LOW) are far and away the leaders of the home-improvement sector. Stereotypically, Home Depot is seen as catering more to men, while Lowe's is favored among women, but the reality is that both companies cater to almost identical customer groups. Home Depot, the larger of the two, counted as the favorite home improvement/hardware shop for about 33% of men and women, according to Prosper Insights & Analytics, while Lowe's counted 28% of women and 25% of men who said it was their favorite home improvement store. Men are more desirable customers than women as they spend, on average, 30% more at such stores. Another study found that 55% of customers at both stores are male, while 45% are female. The average age of a Home Depot shopper is 50, and 49 at Lowe's, and Home Depot's customers' average income of $60,800 was higher than Lowe's number of $54,000, though that could be more of a function of geography than anything else. Overall, Home Depot and Lowe's seem to be more similar than different in their customer demographic, though the two may have different strategies for marketing to them. Finally, it goes without saying that Home Depot's most valuable customer is the one interested in spending money to improve her home. Since home values bottomed out in 2011, Home Depot's profit has about doubled as Americans have become more interested in upgrading their residences. Big-ticket items have seen a particularly spike in sales, indicating that consumers are feeling more confident in rising home values, which, combined with low interest rates, has allowed many Americans to refinance, giving them additional income to spend on their homes. Other research shows that home-buying among millennials is finally beginning to pick up, after a delay, which will be a further boon for Home Depot. Finally, the hot housing market has meant that inventory is low in much of the country, meaning home owners interested in upgrading to bigger homes may have more luck simply investing in their current house. In March, housing inventory across the country was 4.5 months, meaning it would take that long to sell through what's currently on the market. That's below what analysts consider a healthy balance at five or six months.